Postmodern musical chameleon and critically acclaimed Brooklyn-based artist Tim Fite is bringing his maverick stylings to Los Angeles' Natural History Museum tomorrow night, April 3rd, as part of the First Fridays concert series! Fite, formerly known as Tim Sullivan, has been stirring the pot with his own unique flavor of funny cultural critique through his new album, Teeth Lost, Hearts Won. 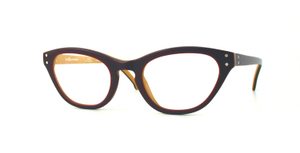 Ever the explorer, Fite recently discovered l.a.Eyeworks while working in Australia, and became quite the fan! Pictured above is Fite wearing (and working) M. Cornu in creamora latte with plenty of attitude (photographed by Cybele). Don't miss this wise guy's special performance as he serves up some musical magic from the east coast! See more of Cybele Malinowski's amazing blazing photographs at bangbangdot.com.